Voters fill out ballots in a gym at St. Sophia Greek Orthodox Church on Tuesday in Albany, New York. We don’t know final turnout numbers for Tuesday’s elections for the same reason we don’t have official winners in the Senate races in Alaska and Virginia: Ballots remain uncounted. Nonetheless, enough data is in for Michael P. McDonald, a political scientist at the University of Florida, to make preliminary estimates of turnout. And what they show is a steep decline from recent national elections. McDonald estimates that just 36.6 percent of Americans eligible to vote did so for the highest office on their ballot. That’s down from 40.9 percent in the previous midterm elections, in 2010, and a steep falloff from 58 percent in 2012. Numbers for 2014 should be treated with care, McDonald cautioned on his website. For one thing, they don’t come from his preferred measure, which is total ballots counted divided by total voting-eligible population; that isn’t available yet. Also, he’s made projections to fill in gaps in the data. “These may not accurately reflect the actual number of outstanding ballots cast on Election Day, outstanding mail ballots yet to be counted, and provisional ballots to be counted,” he wrote. McDonald’s preliminary numbers show big differences among states. 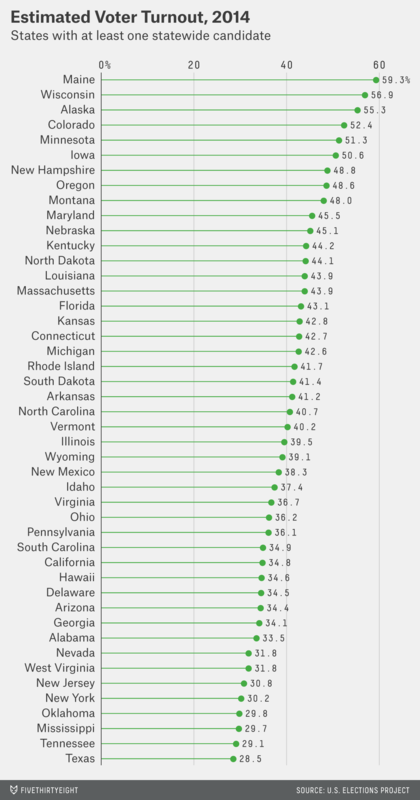 Nearly 3 in 5 eligible voters in Maine turned out, while fewer than 3 in 10 did in Mississippi, Oklahoma, Tennessee and Texas — all of which had at least one contested Senate or gubernatorial race. 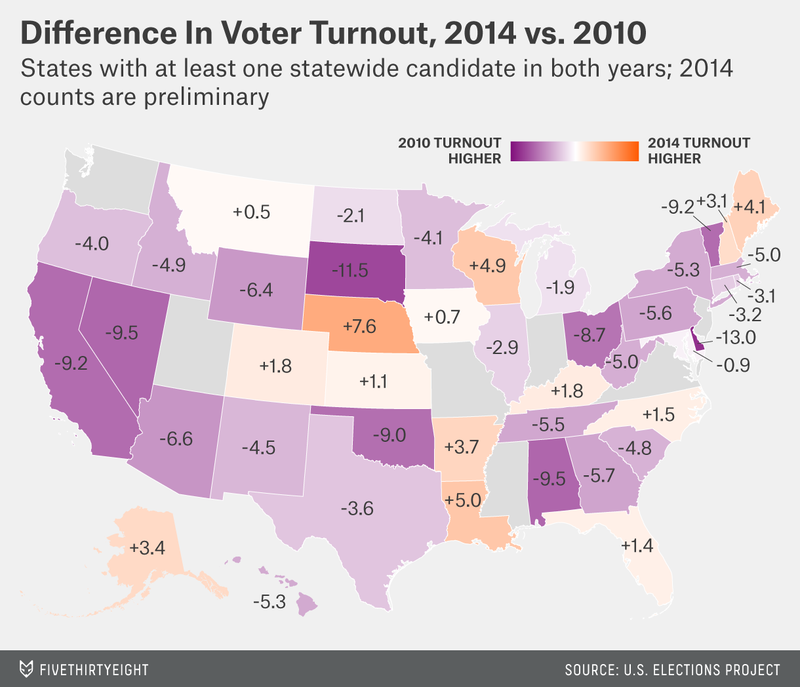 It’s no surprise that turnout lagged the 2012 level. That’s normal for midterms relative to the prior presidential election year. The big drop-off from 2010 — greater than 10 percentage points in four states, including Delaware and South Dakota, which both had Senate elections — is a bit more surprising (although, not too surprising).